Enjoy a nice view of Mt. Le Conte and the Great Smoky Mountains from this luxury cabin just minutes from all the attractions. A perfect cabin for honeymooners or a couple looking for a romantic getaway. 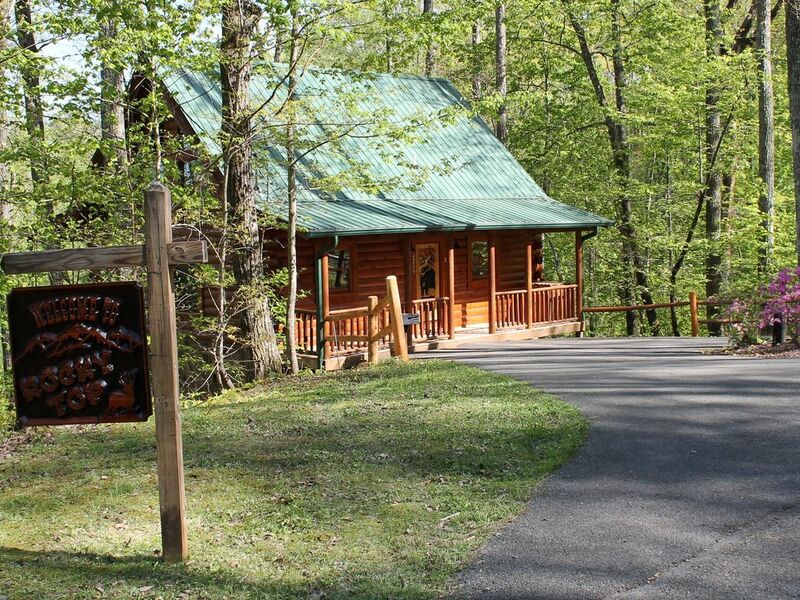 Rocky Top is a one bedroom, one bath cabin nestled in the woods on an acre of land. You will find this luxury cabin clean and tastefully furnished throughout. The all-wood interior and stacked stone gas fireplace gives this true log cabin a warm, cozy feel - the perfect place to get away from it all. Neighbors on all sides are a good 150+ feet away so you have lots of privacy. After a fun filled day -- whether hiking in the Great Smoky Mountains National Park, outlet shopping in Pigeon Forge, or enjoying the many attractions of Gatlinburg - relax on the back covered deck in one of the rocking chairs taking in the beautiful view of Mt. Le Conte or soak in the private hot tub. Inside the cabin, you can play some air hockey in the loft, read a book, or watch a movie on the 42" LED HD Flat Screen TV. For those that need to stay connected there is free wireless internet (Wi-Fi). We're from New Orleans and love to cook, so you will appreciate the fully-equipped kitchen. Or why not barbecue on the charcoal grill outside. Rocky Top is conveniently located on the north side of Gatlinburgs Arts and Crafts Community only 10 minutes to Downtown Gatlinburg, 15 minutes to Dollywood, Splash Mountain and The Island in Pigeon Forge, 8 minutes to the Food City Grocery Store and 15 minutes to the main entrance to the National Park. The cabin has a paved circular driveway. If mobility is a concern, you will appreciate the fact that one small 6-inch step will get you into this luxury cabin and the master suite is located on the main level. This is where we vacation. We enjoy our vacation home and know you will too! You will not be disappointed. Rocky Top is rented by us, the owners. When you email or call about the cabin, you will be speaking directly with the owner - not a management company. We know more about our cabin than any management company ever would or could. It is our second home and we take pride in sharing it with you. We are responsive owners who answer inquiries/emails quickly and attend to our guests questions and concerns to help make their vacation the best! If our cabin is booked, email us with your dates - our next door neighbors cabin might be available. We offer trip insurance which covers our guests in emergency situations like inclement weather, sickness, or loss of a job. Cancel for Any Reason Insurance is also offered in case some type of non-emergency situation arises that prevents travel. We love the mountains and Gatlinburg is the perfect place! Not only do you have the Smoky Mountain National Park but all the fun of Gatlinburg with plenty of shopping, dining and attractions. Pigeon Forge is next door and only 15 minutes away. This includes Dollywood, Splash Mountain and the Pigeon Forge Strip. Great neighborhood, only 19 log cabins on 1 acre lots, lots of privacy, street lights, paved roads and close to everything. Cabin has circular driveway for easy in and out. Only 3 miles to Food City for gas and groceries, 5 miles to Downtown Gatlinburg, 2 miles to new Rocky Top Sports Complex, 15 minutes to Dollywood, Splash Mountain and the new 'The Island in Pigeon Forge'. Awesome back deck. It is covered so you can sit out there in the rain and take in the beautiful view of Mt. Le Conte. My wife and I could sit out there for hours just to relax. Security Camera for driveway and front door for the safety of our guests and their belongings. We had a fabulous experience starting even before we arrived. Melissa is an amazing host and communicates so thoroughly everything you could possibly need to know. From all the info on the cabin to things to do around the area. Any questions we had she texted back immediately. The cabin is fantastic. Sooo warm and welcoming. The king size bed is the most comfortable bed ever. Having a washer and dryer was great because now I'll have no laundry to do once we are home! The hot tub was the perfect way to end every night. So relaxing and quiet on the deck in the late evening. The views from the deck are spectacularly beautiful. Camera worthy from sunrise to sunset. We also loved that neighboring cabins are far enough away that you really have all the privacy in the world. The kitchen is fully stocked with all the supplies we needed. We stopped at the small food store at the bottom of the road and got everything we needed for meals at the cabin. Alot of conveniences just before you head up the road if you need anything. The drive to the cabin was not bad at all. I've read some reviews about roads being impossibly steep....these roads were fine for our Ford Escape and I loved it has a flat circular drive way. Shower has good water pressure and air conditioning worked well. Very clean. If you're looking for a cabin... you just found it. Look no further and book this one. We will for sure next time we come to the area. The cabin was perfect for a weekend getaway. The view was terrific! The hot tub was the perfect size for the two of us. We cooked, grilled, and just relaxed. It a was perfect place to unwind and relax. Close enough to civilization but far enough away. We had an amazing getaway. Melissa and Graylin were quick to respond to any questions we had and even let us know we could check in early. They provided a lot of great information about the area as to where to eat, what activities are close, and beautiful trails. Lovely cabin in the woods, private, great views, very responsive owners. The cutest and relaxing cabin! First off, Melissa was an awesome host! They have everything there that you could need during your stay. Perfect distance from downtown with a good mix of privacy. The bed is soo comfy and the hot tub is great too. And the view of the mountains is beautiful. Loved this cabin; wish we could’ve stayed longer! !